Before I started training with Abby, I had lost my way on my fitness path. I was lethargic and weighed more at this point in my life than I had weighed since the birth of my children (the youngest of which had just turned 15). I have always been active. I was a competitive distance swimmer in school, on the dance team, and in recent years, I had been playing ice hockey. I had also fallen in love with Crossfit. However my body was showing some limitations, and having to modify everything I was doing in regular Crossfit class due to these limitations was causing me to be less and less motivated to work out. Then I witnessed a good friend get severely injured playing hockey and realized I couldn’t continue to take that risk. I was depressed, and I wasn’t having fun anymore. 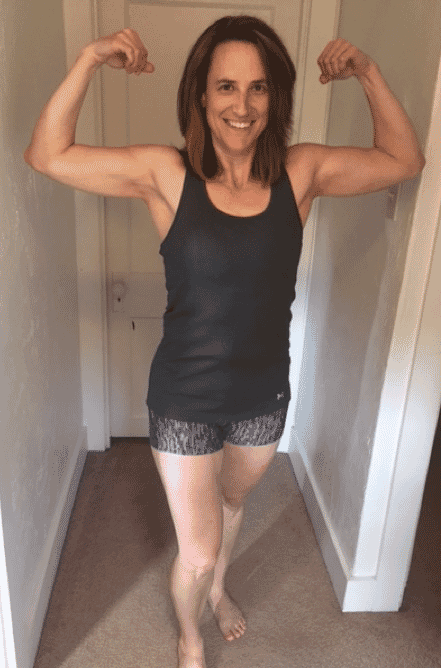 I had met Abby as one of my Crossfit coaches, and several of my friends had started working individually with her private programming, and they were loving it. So I met with Abby, and we started talking about my goals, motivations and my limitations. I was excited to start working out again! Abby really took the time to figure out what I was able to do, and where I wanted to go. Sure I had limitations, but there was never a focus of “you can’t do that”. Instead it was “lets do this”. I no longer felt like I was missing out on anything. I was motivated to conquer the workouts Abby designed for me. Having someone base workouts from my feedback, specifically for me was a very satisfying experience. The workouts were challenging, and I loved doing every single one of them. It was fun, and Abby knew just how to keep me motivated. And when I got a little too “gung ho” about my workouts and pulled my hamstring not taking the prescribed rest days, Abby didn’t reprimand me. She taught me that listening to my body and backing off was not a step backwards. We worked together. Her guidance on my nutrition was also key. I started eating what my body really needed, and more food than I ever thought I would be able to eat and still lose weight! Now, 6 months after starting with Abby, I understand my body so much better, and how to fuel it. I am down almost 20 pounds from when I started. The actual number on the scale wasn’t my biggest achievement though. My energy level and attitude is so much more improved. I feel like myself again, and I will never be able to thank Abby enough for that.